Saint-Romain, France; October 25, 2017 – TraceParts, a world-leading supplier of 3D digital content, has produced a detailed report on the CAD models of castor, wheel and handling trolley products downloaded according to product family, country, job, department and area of activity. Engineers spend hours scouring the web in search of the 3D CAD models that they need for their designs. But that time is wisely spent, since finding the right component prevents them from having to design parts from scratch! That explains why several manufacturers and distributors of castor, wheel and handling trolley parts disseminate their 3D product catalogs over the TraceParts publication network. With 17 million designers accessing the network, not only castor, wheel and handling trolley products but also many other parts are validated and incorporated directly into design projects in a format that is compatible with all CAD programs. By having their parts selected during the design phase, vendors can keep abreast of the latest projects in progress and provide both their existing and prospective customers with technical and sales support. The latest design report on castor, wheel and handling trolley parts from TraceParts reveals detailed data about the CAD files downloaded according to product family, country, job, department and area of activity, and will enable many vendors to sense where the market will be heading in 2017. 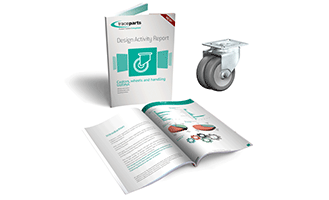 The TraceParts activity report on castor, wheel and handling trolley products is available free of charge from the page /pcs/publishing-3d-catalogs/the-traceparts-cad-content-platform/product-ranges/castor-wheel-handling-trolley/.